Ever since I read about Huck Finn with his freckles and his fishing pole and battered old straw hat and the runaway slave Jim floating around on the mighty river on a plain old raft, I’ve wanted to experience its mightiness, troll its amazing length, visit the towns along its waters. Those places with exotic names like Natchez, Baton Rouge, New Orleans… names I first read about in a gloomy, bricked-up part of north London many years ago. And now at last, here I am on a luxurious cruise on board the American Queen, the only really truly paddle steamer on the Mississippi you can actually sleep on. In what is nothing less than a stateroom with a queen size bed and a bathroom bigger than ours at home and a door that opens onto the promenade deck. It’s all so 19th century and luxurious. At any minute you expect a fabulously large, handsome African woman in a blindingly white pinafore to hand you a mint julep. 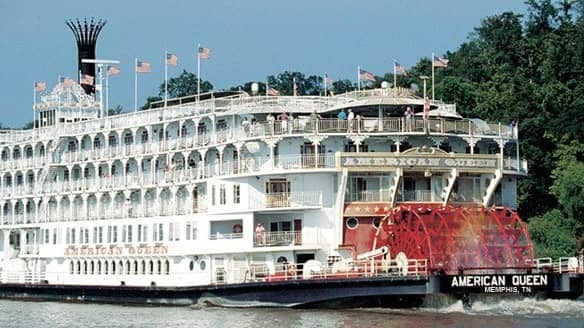 In fact the American Queen is a replica of an original steamboat palace and it’s easy to imagine Mr Twain, river boat pilot, at the helm while down in the saloon bar, green eye-shaded gamblers sit with their eyeballs hanging out over their cards all night playing poker or whatever those gambling men played. Sheer heaven. 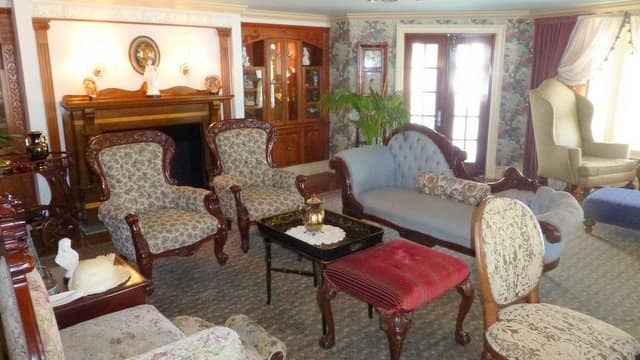 After languishing since 2008 when the most recent owner went bust, in true American style, the American Queen was relaunched in April 2002 with a $6 million “sprucing” of its Victorian décor. And what a spruce-up it is. My first feeling, as I step onto the grand sweeping staircase leading to the upper decks is, oh no, this is the Titanic, will we survive? Then I think heartlessly, forgetting all those poor buggers in steerage, of course we will, we are travelling first class. The truth is, everyone gets to travel first class on the American Queen. Even the inside cabins are beautifully appointed, with Queen Anne furniture, a soft-as-a-cloud bed, with the river rocking you gently in its arms, you are right up there with Bonnie Prince Charlie, and his “ocean’s a royal bed.” What could possibly go wrong? Very soon I chided myself for even thinking that thought because something did go wrong. An exceptionally high river tide puts us into a steep bank where we remain trapped for twenty-four hours, thus missing at least one of the daily shore tours. But, who cares? The good ole Mississippi lives up to its promise and more, providing daily excitement as huge tow barges carrying loads of timber, coal and other stuff essential to the lives of the towns along the river as it has for a couple of centuries. It’s impossible to be bored with this river. It’s as active as a beaver. When the barges are absent, there are those mysterious whorls and eddies that remind the fanciful watcher of trolls and mysterious creatures living under the river, ready to pull down anything and anybody in their path. Odd bits of timber float like sleeping seals down from flooded areas higher up. It’s the busyness of the river that gets you and carries you along on its silky cliffs and ridges; keeps you entertained so there is never any possibility of boredom. Then there are the spirals of whirlpools with their centres pointing straight down and underneath the weight of the water you can imagine the River Gods must reside, or at least a troll or two, waiting to crunch on a juicy human if one should tumble in. Every morning our tea is delivered by a friendly cabin assistant, as we sit at our table outside the cabin overlooking the river, and ponder the day ahead – a visit onshore to a real plantation, before mustering up the energy to go to breakfast in the opulent J.M White dining room. 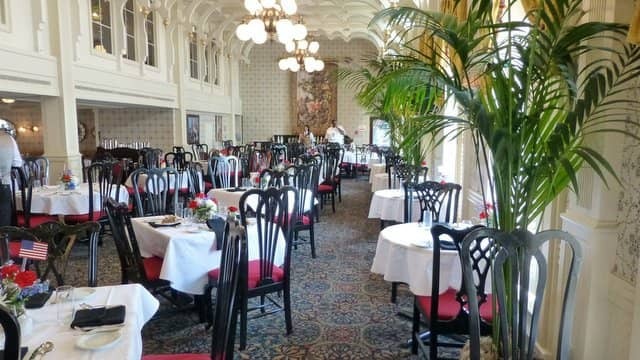 The quality of the food is very important on a cruise of any kind, but especially when travelling up the Mississippi for the simple reason, there are no friendly European villages with superb eateries waiting along the shoreline. You are trapped on this vessel dawdling at a speed of 8 miles an hour alongside a shore dotted with, well, swamps, bayous, trees and more swamps. There is nowhere else to go and get your vittles, so it has to be good or I’m not playing. The Queen does not let us down. In fact, if you ate all that is provided, you would end up the size of a carthorse by the time you reach Memphis, the getting off point. The choices are many. You can either eat a more formal meal in the opulent J M White dining room with its attentive waiters, chandeliers, and abundant buffet full of things like crawdads, catfish, grits, (don’t bother, tastes like baby food) and just about any food you care to think of, or the Front Porch Café, where they cook the pizzas/quesadillas/pancakes while you wait. There is also a icecream machine that make those swirly topped ice creams with dubious connections to anything dairy but good for sweet toothed cruisers who seem particularly attached to the confection. You can have one of those any time of the night or day, a boon to those of us with kiddie taste buds. For the more mature palates, there is non stop espresso coffee in the Mark Twain Room which, all by itself makes the whole trip worth while. 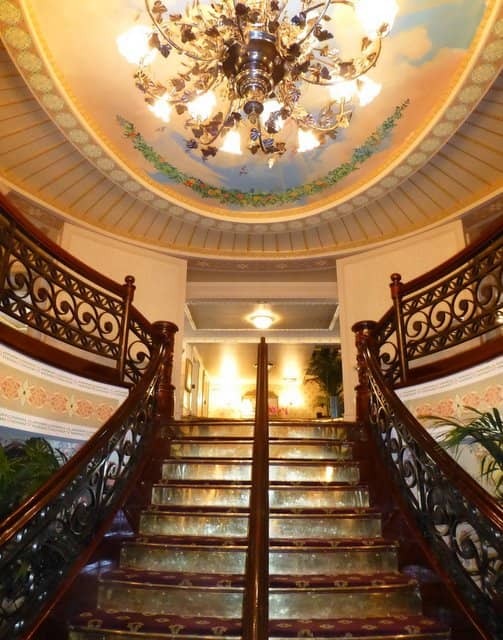 It’s decked out much as a riverboat saloon was in Mr Twain’s day with bear and deer heads looming from the walls in the gentlemens’ smoking room, antique tables and chairs, even a bookcase with copies of his books. It is not hard to imagine a polished table crowded with riverboat gamblers in green eyeshades, losing fortunes, plantations, or just a weekly wage as they play the night away. Mark Twain did it, or maybe he just wrote about it. Those erstwhile gamblers would not have enjoyed the benefits of the three enormous meals a day, not to mention morning and afternoon tea, as for the ice cream machine delivering those twirly soft serve confections, well, just forget it. The Ladies parlour is also exquisitely furnished with strict attention to Victorian detail and you don’t have to be female to be in there either. The menu is overseen by Southern chef Regina Charboneau and consequently reflects the country through which it is passing. Lobsters stuffed with crab meat, mock turtle soup, fried chicken are bookended with the Natchez beignet filled with vanilla ice cream and warm praline sauce, fig bread pudding with caramalised sugar sauce and chocolate layer cake. At lunch, expect things like smoked catfish BLT, quail and mushroom salad, fried oysters, baked ham with Coca-Cola sauce, (homage to Vicksburg Mississippi, which is where Coca Cola was first bottled. If you are still hungry, you can eat finger sandwiches, cakes and cookies from 4 to 4-30 every day. Look, it is possible to do nothing but eat all day on the Queen, if you are that way inclined. In addition, there are the daily tours to various ports of call along the way. Some more fabulous than others. I found Vicksburg fascinating, with its Civil War museum, its collection of enormous canon balls with which those who fought wreaked as much damage on each other as they possibly could. The Southern States’ final surrender was signed at Vicksburg, quite deliberately on the same day as American Independence Day, so the American people would always remember that, for the Southerners, this was a bitter surrender indeed. It is certainly not forgotten in Vicksburg, where the Confederate flag still flies in many hearts and minds. Apart from the interesting and informative lectures by an expert “Riverlorean”, there are riverboat shows every night, if that is your thing, as well as the occasional film. We saw “Lincoln” in what is a replica of the same theatre in which Abe himself was shot, although, bad luck, the theatre does not feature in the film. In the same theatre we heard a Mark Twain expert from UCLA discourse on the political, cultural and social significance of the much loved childrens’ book Huckleberry Finn. If visiting the towns along the way and nightly riverboat shows are not your bag, it is possible to remain on the boat and just watch the silky slick of the river go whispering by, carrying its load of tree branches and odd objects, washed down from flooded areas further up the river. Old Glory, the Mississippi River is hypnotic and meditative in its beauty. I would do this trip again in a heartbeat. 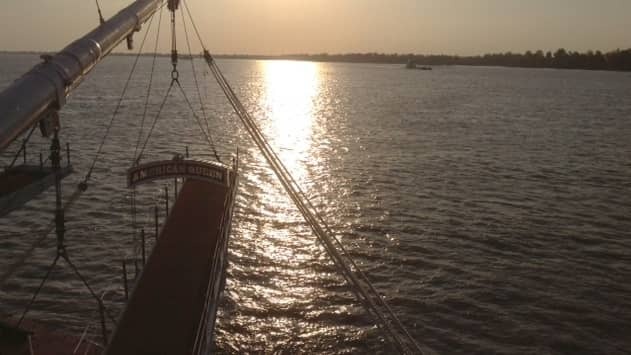 This is a cruise I would recommend highly to anyone with a sense of history, who wants a relaxing, interesting ride up one of the world’s busiest, thriving rivers on a luxurious boat, no holds barred as to comfort, great food and entertainment.